The ciaccona originated in the late 16th century as a dance-song popular among slaves and native Americans in the Spanish colonies of South America. It was thought to be invented by the devil because of its suggestive movements and mocking text which included the refrain “Let’s live the good life; let’s go to Chacona!” Traditionally accompanied by guitars, tambourines and castanets, it soon became Spain’s most popular dance and evolved into a French courtly dance, the chaconne. Its short, powerful pattern of only four basic harmonies made it an ideal ground bass for virtuoso instrumental and vocal embellishments. The passacaglia, originating in Spain in the 17th century, is taken from the words “pasar” (to walk) and “calle” (street), and referred to the few bars played by strolling guitarists between verses of a song. Over time it evolved into “dancing in the streets” with a variety of bass formulas on which sets of variations were built. The bergamasca was a folk song or dance from the Bergamo region in northern Italy with a recurring harmonic scheme widely used as the basis for instrumental variations in the 17th century. Lively stuff. Such material fits L’Arpeggiata’s calling card like a glove, providing them with fertile ground for exploring the close links between baroque music and popular folk music of the early European and Latin worlds. Retaining the original elements of both kinds of music, L’Arpeggiata magically transports them into the modern world and adds their own jazzy improvisations to the mix. Their music exudes the song-and-dance excitement of common street folk from centuries past, infusing it with their dazzling instrumental and vocal improvisations above a steady and rhythmic ground “ostinato” bass (translated into English as stubborn or “obstinate”) that is found in the ancient traditional music described above. This CD was my introduction to L’Arpeggiata, and what a stunning introduction it proved to be. The opening track (the only selection not composed by Landi) appropriately sets the stage. It is an anonymous tarantella vibrant with “folksy” syncopations from lute, theorbo, baroque guitar, viola da gamba, bass viol, psalterion (hammer dulcimer), ancient percussive instruments, and the memorable tenor voice of Marco Beasley, who makes the soul of this ancient music of the streets come alive through his unique phraseology and delivery. See a video performance of the song here. 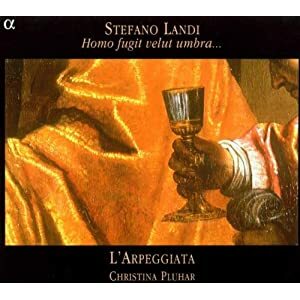 Stefano Landi: Homo fugit velut umbra is indeed a stunning album which breathes vibrant life into Landi’s music. It should have a wide appeal not only to early baroque music lovers, but also to those who enjoy traditional world folk music, as should all of L’Arpeggiata’s recordings. About the second track, she writes: “The bass line of “Ohimè ch’io cado,” is a walking bass…Here we have allowed ourselves a little scherzo musicale in order to bring out the cheeky modernity of this bass.” She is not kidding. I was a bit shocked when I first heard it, sure that this could not possibly be Monteverdi. But indeed it is, and it is ingenious what L’Arpeggiata does with it. Pluhar searches far and wide to recruit just the right artists to create what she calls “a living baroque” for each of their programs, and for Monteverdi’s music she has brought on board another cornetto player, the very talented jazz musician Doron David Sherwin who adds the significant spark to “Ohimè ch’io cado” with his bold improvisational technique. Hear it for yourself here. Amazing! Immediately following “Ohimè ch’io cado,” we are treated to a sensuous blending of the voices of superstar countertenor Philippe Jaroussky and Spanish soprano Núria Rial in a stunning performance of “Pur ti miro,” the final duet based upon a four-note ground bass from Monteverdi’s opera L’Incoronazione di Poppea, often cited as one of the most sensuous and beautiful love scenes in all of operatic history. Monteverdi never published a collection of instrumental pieces, but L’Arpeggiata has lifted snippets of sinfonias and sections from his various other works and interspersed them throughout the vocal pieces to round out a superb musical program that begs for repeated and rewarding listens. 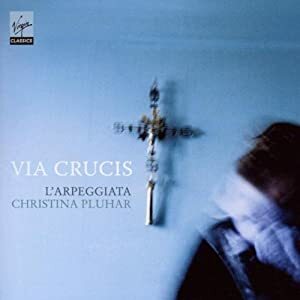 2010’s Via Crucis focuses on Mediterranean passion (of a religious nature) from composers in northern Italy and folk traditionals sung in the streets of southern Italy and the island of Corsica. The music is presented as a fictional 17th century Italian mystery play based on “The Way of the Cross” divided into three sections: the vision, the death of Christ, and the resurrection. Once again Christina Pluhar works her magic by using her knack for pairing just the right artists with the particular musical focus. In this case, she retains countertenor Philippe Jaroussky, Spanish soprano Núria Rial, and cornetto master Doron David Sherwin, but goes one further by adding the Corsican folk quartet, Barbara Furtuna – a stroke of programming genius, as their earthy vocals provide a delightful contrast to the classical refinement heard from Jaroussky and Rial. Jaroussky has two solos – one an anonymous lullaby, and the other a gorgeous aria from the Italian composer Benedetto Ferrari (1603-1681). Jaroussky and Rial join forces in one duet, “Lumi, potete piangere” by Giovanni Legrenzi (1626-1690), with breathtaking results. Two Stabat Maters are presented back-to-back: an impressive Corsican traditional performed by Barbara Furtuna, and a beautiful version of Giovanni Felice Sances‘ (1600-1679) performed as a solo by Rial. Rial has two more solos – a very ethereal interpretation of “Hor ch’è tempo di dormire,” composed by Tarquinio Merula (1594-1665), and Claudio Monteverdi’s “Laudate dominum.” The Corsican traditional, “Maria (sopra la Carpinese),” absolutely oozes with authentic religious passion from Corsican villages of centuries past. Sherwin’s cornetto opens the piece with a single soft note, building to a crescendo that leaps from the speakers clear as a bell before the vocals take over. The song is truly beautiful. A video performance of it is here. The instrumentals included on the disk are just as lovely. They include two selections from the Rosary Sonatas composed by Heinrich Ignaz Franz Biber (1644-1704), a brief somber piece by Michelangelo Rossi (1601-1656), a passacaglia medley combining works of Maurizio Cazzati (1616-1678) and Giovanni Antonio Pandolfi Mealli (1630-1670), and a delightful canario by Gregorio Allegri (1582-1652). For the last track Pluhar has a surprise in store for us, ending the program with the modern composition “’Stu criato” written by Enzo Gragnaniello. Gragnaniello is a pop singer and songwriter from Naples with an interest in exploring the roots of traditional Neopolitan folk music. Pluhar has recruited the award-winning Italian ballet dancer and alto singer Vincenzo Capezzuto to perform “’Stu criato,” and it serves as a tantalizing finish to this over-all excellent CD. Listen to the performance of it here. Since their formation in 2000, L’Arpeggiata has rolled out one recording after another, pretty much all of them being award-winners. The three albums I’ve discussed are the ones I have, but I know I will eventually end up with all of them. I have already tagged La Tarantella: Antidotum Tarantulae as my next acquisition. Besides the traditionals, the tracklist includes three works from the German composer Athanasius Kircher (1601-1680), a truly fascinating individual referred to as “the last man who knew everything” by the editor of a book of articles about him. The Museum of Jurassic Technology in the Palms district of Los Angeles has a permanent exhibit devoted to the life and works of Kircher, and there is an online research project devoted to him maintained by the Institute and Museum of the History of Science in Florence, Italy. 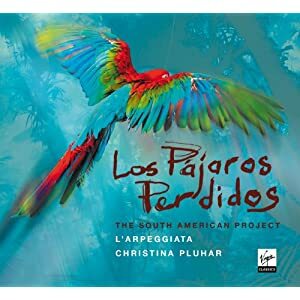 Los Pajaros Perdidos: The South American Project looks hard to resist. It includes an increased number of modern compositions mixed in with the old, including guest instrumentalists Raul Orellana on the charango (a small Andean stringed instrument of the lute family traditionally made with a shell from the back of an armadillo), the Paraguayan harpist Lincoln Almada, and the Argentinian guitarist Quito Gato. Pluhar retains countertenor Philippe Jaroussky, and expands the number of contributions from ballet dancer-singer Vincenzo Capezzuto. She brings back Italian folk singer Lucilla Galeazzi (who appeared on La Tarantella), but replaces Rial with another excellent Spanish soprano, Raquel Andueza. Andueza appeared on L’Arpeggiata’s previous CD, Monteverdi’s Vespro della beata vergine, which I haven’t yet heard, but I loved Andueza’s performance on José de Nebra: Miserere. One of the modern selections included on Los Pajaros Perdidos is a solo by Andueza of the bolero “Bèsame Mucho,” which is sure to be among the album’s highlights. To listen to this spectacular performance, go here. This new release from L’Arpeggiata promises to be an outstanding addition to their discography. I wouldn’t be a bit surprised to see Los Pajaros Perdidos make one of Stephen Nereffid’s lists in the coming months. Kezzie Baker lives in the heartland of America and if there’s one thing she likes better than listening to all kinds of music, it’s talking about it. There are just way too many truly great artists that never receive the notoriety they deserve. She tries to do what she can to change that by spreading the word around to anybody who will listen. Wonderful post! I love this early music that still bears the marks of popular music and can be performed as something other than museum pieces. Thanks, Bad Thoughts. I love this kind of stuff, too. The Corsican folk quartet on Via Crucis really adds an extra ‘oomph’ to the music for me. A week ago early morning WQXR in NY played a piece by Arpeggiata called Jacaras. I’d like to buy it for my iPod collection of favorite music. I cannot find it anywhere. Please direct me how can I access it. Thank you. Robert, what you heard was probably on L’Arpeggiata’s 2010 album, “Los Impossibles.” I believe the CD is sold as an import in the US and can be difficult to find but digital downloads should be readily available through most popular digital download websites. Hopes that helps! Thank you for all this valuable information. I heard Barbara Furtuna singing Maria with L’Arp. on a Boston classical radio station and have been transfixed ever since. Any idea where I might find the lyrics?